Here There Be Monsters! What is a hero without monsters to vanquish? Within this tome you`ll find fire-breathing dragons and blood-drinking vampires, vile demons and shapechanging werewolves, sadistic goblins and lumbering giants, and so much more! Yet not all the creatures in this book are enemies, for some can serve lucky heroes as allies or advisors, be they summoned angels or capricious nymphs. And it doesn`t stop there - with full rules for advancing monsters, adapting monsters to different roles, and designing your own unique creations, you`ll never be without a band of hideous minions again! 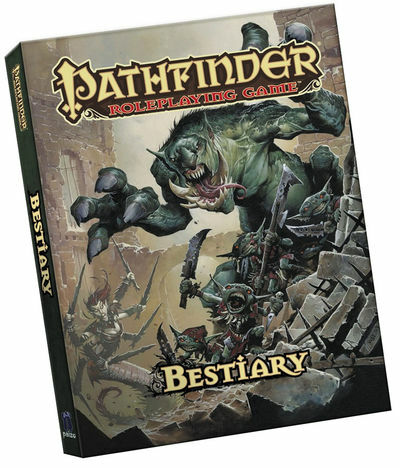 Now available in a compact and cost-effective size, this must-have companion presents hundreds of different creatures for use in the Pathfinder Roleplaying Game!